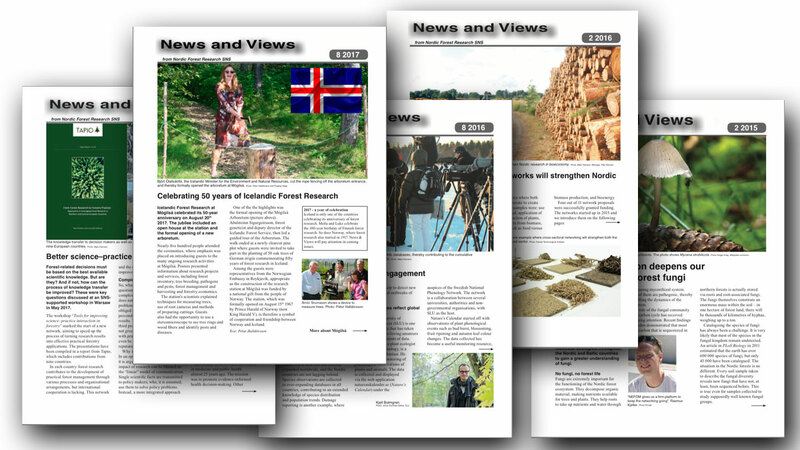 News & Views is published regularly in Scandinavian Journal of Forest Research and on SNS’s webpage www.nordicforestresearch.org, 8 issues per year (6 issues until 2011). News & Views is edited and produced by Silvinformation (until 2016 i collaboration with Carl-Henrik Palmér, Areca Information). 2019-4: New SNS-supported networks: Nordic cooperation group for forest inventory; Promoting sustainable forestry – PROFOR; Nordic growth and yield researchers network; Northern European network for wood science and engineering; Sustainable use of wood ash – NORDASH; Predictability of climate risks – NordicProxy. Shortcuts from Nordic forest research. Meeting cultures in Nordic countries; Greenhouse gas emissions. 2019-3: New SNS-supported projects: Invasive pests – biogeographic analysis; Preventing the spread of invasive pathogens; Conservation of resistant ash genotypes; Where is the water in acetylated wood? ; Liberation and solution properties of wood hemicelluloses; Shortcuts. 2019-2: Nordic cooperation on Phytophthora; Nordic cooperation on extreme weather; New climate strategy gives Icelandic forests a boost; Shortcuts. 2019-1: IUFRO 2024 to Sweden, interviews Fredrik Ingemarsson and Jonas Rönnberg; Woodland key habitats, a review; Shortcuts. 2018-8: Scandinavian Society of Forest Economics (SSFE) 60 years; Perspectives – Climate change; Climate change in global media; Forest film across the border; Shortcuts. 2018-7: The burning hot summer of 2018; Lookout station; Perspectives – Nordic bioeconomy; Den fantastiske skogen; Film about uneven-aged forestry; Shortcuts. 2018-6: SNS promotes cooperation – a story about networking; biomass utilization and sustainability (two network reports); Strategy for Nordic bioeconomy; Shortcuts. 2018-5: Forestry and fungi (NEFOM network); Emerald ash borer (EMERALD network); Shortcuts. 2018-4: Varying widths of protection zones along water; CAR-ES III; Climatic impact of drained organic soils; State of the Nordic Region 2018; Shortcuts. 2018-3: Better science-practice interaction needed; new strategy for SNS; global deforestation; shortcuts from Nordic forest research. 2018-2: Finnish forest research 100 years, the history; Four new networks in wood science; SNS at COP23. 2018-1: Norwegian forest research 100 years, the history: Tandem forest values; New webpage for SNS. 2017-8: Celebrating 50 years of Icelandic Forest Research; Time for a Fennoscandian Red List? ; Record classes in the Euroforester program; Closer ties between Skogforsk and Luke. 2017-7: Five new cross-sectoral networks; 50 years of plant science in Umeå; Shortcuts from Nordic forest research. 2017-6: Climate mitigation in focus at Nordic Ministers’ meeting; Ålesund clippings; Shortcuts from Nordic forest research. 2017-5: Formas interview: Communication must be integrated; Park investments pay back – Finland and Sweden; Shortcuts from Nordic forest research. 2017-4: Attractive Hardwoods, presentation of an EU project; ThinkForest; NOFOBE promotes bioeconomy research; Shortcuts from Nordic forest research. 2017-3: Towards a Nordic bioeconomy strategy (The Nordic Bioeconomy Panel); Nordic Forest Solutions – strengthening the Nordic voice; Shortcuts from Nordic forest research. 2017-2: New SNS-supported networks; Urban forest management; Future research topics discussed at Nordic-Baltic meeting; Shortcuts from Nordic forest research. 2017-1: WAMBAF – focuses on water in the Baltic Sea region; Time to get a joint grip on Nordic science communication (network meeting); Cross-sectorial promotion bioeconomy (Matchmaking Day); How to build green, climate-resilient cities. 2016-8: Citizen science and public engagement; Creating recreational forests – consider the ground cover; Kick-off of NB-NORD and Phytophtora project. 2016-7: HealGenCAR, Can genetics save our forests? ; Nordic forestry aware of climate change, but needs to take action. A survey from NordGen Forest; NordGen Forest raises awareness of genetic resources. 2016-6: WOOD-PRO will add value to wood by-products; Forest resource model free for all (about EFISCEN); Celebrating journals keep growing (about SJFR and WMSE); New secretary of SNS; SNS and NKJ combine offices. 2016-5: Uneven-aged forestry unites Swedish and Finnish researchers; Relationship between regional fire activity in Scandinavia and North Atlantic ocean circulation; Research communicators: press-releases are key. 2016-4: Combined data: revolutionizing forest planning (CARISMA network); Shortcuts from Nordic forest research. 2016-3: HealGenCAR – presentation; Put pressure on researchers to communicate (interview Lena Gustafsson); Shortcuts from Nordic forest research. 2016-2: Four new cross-sectoral networks; Shortcuts from Nordic forest research. 2016-1: ENERWOODS: We can double the biomass production at stand scale; Intensive forestry saves more carbon; Potential to extract more energy; Replacing coal has immediate climate benefits; More options with second generation hybrid aspen. 2015-6: Will biofuel aircrafts take off (Kes McCormick); Researchers need to think cross-sectorially (Matchmaking Day); Borderless use of reforestation material (Finland-Sweden). 2015-5: Heureka expands abroad; Shortcuts from Nordic forest research. 2015-4: Tapio translates research into best practice; The first forest tree seeds deposited at Svalbard Global Seed Vault; Shortcuts from Nordic forest research. 2015-3: WSE network: Wood is the urban future; SKOG22, strategy for Norwegian forests; Shortcuts from Nordic forest research. 2015-2: NEFOM network: Molecular revolution deepens our understanding of forest fungi; New and continuing networks; Editor shift in SNS’s scientific journal. 2015-1: Carbon storage in Nordic forest soils (the FSC-sink network); Scientific writing is telling and selling a story; Forest policy science conference. 2014-8: OSCAR2 – a successor of a success; The contractor is the backbone of Nordic forestry; Trackless logging – new technology protects water and soil. 2014-7: Nordic bioeconomy promoted in Salt Lake City; Forest certification celebrates 20 years; Metla becomes Luke; Changes in the IUFRO board. 2014-6: Close to the application of somatic embryogenesis (network AdapCAR); WoodBio will enhance forests’ role in the Nordic bioeconomy. 2014-5: Örnsköldsvik – a centre for green conversion; New network will highlight the role of dead wood in the carbon cycle; How much dead wood? Depends on definition. 2014-4: Coordinated research will shed new light on regeneration in uneven-aged forestry; New technology challenges university learning; Shortcuts from Nordic forest research. 2014-3: SUMFOREST will reinforce forest research; Natural disturbances – we need to act now (network FORDISMAN); Governance instruments in focus (network Forests in urban and rural studies). 2014-2: Waldwissen.net – translates research into practice; Grants for Nordic forest research networks; SNS secretariat moves to Sweden. 2014-1: Urban forestry – where trees meet people; CARe-FOR-US, Cares for the urban forests; A next to harmonise social indicators for recreation and tourism; Shortcuts from Nordic forest research. 2013-8: Rules for water footprints disfavor wood from Nordic-Baltic forests (network CAR-ES); Vi-Agroforestry 30 years; The transition to a bio based economy needs social science. 2013-7: Introduced species in a changed climate; Shortcuts from Nordic forest research. 2013-6: New light on causes of ash decline; Nordic workshop on bioeconomy. 2013-5: SLU pioneer contributions to Wikipedia; More freedom for forest owners with a revision of Finnish forest law; Phytophthora – new threat with knowledge gaps; Shortcuts from Nordic forest research. 2013-4: Use me to communicate your research – interview with SKOGEN editor; New SNS-EFINORD networks. 2013-3: Two centuries in service of the green sector – KSLA celebrates; New SNS projects; Make your voice hear – blog in NB Forest; EFI celebrates 20 years. 2013-2: Communication pays off – interview with Metla head of communication; Research must be implemented; Seasonal changes mapped by satellite (SNS project). 2013-1: Xylan modification may allow customization of wood properties; Nordic wood furnishes Council of Ministers’ office; Finnish-Swedish teamwork helps foresters prepare for climate change. 2012-8: Boosting Nordic wood sales with green marketing; Future Forests changes thinking in forest research; Bioeconomic initiative will strengthen green growth. 2012-7: Invasive pathogens demand sophisticated warning systems; Selfoss declaration – four years later. 2012-6: PRIFOR takes on the pioneer’s work; SNS celebrated – We are ready for the next 40 years; Shortcuts from Nordic forest research. 2012-5: Woody biomass needed to terminate our dependence on fossil fuels (ENERWOODS); Wood Material Science and Engineering; Shortcuts from Nordic forest research. 2012-4: Building Nordic forest research networks for 40 years (SNS celebration); Positive evaluation of SNS. 2012-3: Sustainable landscape management in practice (EU-project Baltic landscape in change); Euroforester students value their network; Shortcuts from Nordic forest research. 2012-2: Wood – the eco-friendly Nordic material; Electropulse can replace chemical preservation; SNS-supported network activities; Good advice for scientific journal. 2012-1: Valuable seed destroyed by insects; New website disseminates Nordic and Baltic forest research; Airborne laser scanning research acknowledged with the 28th Marcus Wallenberg Prize. 2011-6: SNS grips mercury and forestry; Distance learning course in forestry celebrates ten-year anniversary; First year as IUFRO president; Towards a forest agreement in Europe (Forest Europe Ministerial conference). 2011-5: Finland’s forests in good shape; Nordic research frequently cited; Jan Svensson, new board member; New research directors at Metla. 2011-4: Retention – an efficient way to preserve biodiversity? ; SNS has opened its new portal; Shortcuts from Nordic forest research. 2011-3: Gender research needs a Nordic perspective; New projects supported by SNS; Shortcuts from Nordic forest research. 2011-2: Kick-start for new forest think tank (SIFI); Brakes off for restyled CARs; Network activities supported by SNS; Why Nordic cooperation? 2011-1: EFINORD officially opened; Open Access – a challenge for the scientific community; Gender research in forestry; Closer cooperation in Norwegian agricultural research suggested by evaluation. 2010-6: OSCAR meets expectations; Laser scanning – where the Nordic countries have taken a lead; Riparian forest is an important ecosystem; New office for Forest & Landscape; Dane leads EFI board. 2010-5: World’s forest researchers chaired by Scandinavian (IUFRO World Congress in Seoul); 25 years in the service of forest science; Scandinavian Journal of Forest Research Jubilee Award to Erik Naesset; 25 years of monitoring forest health (ICP Forests). 2010-4 – no N&V (special Anniversary issue for SJFR 25 years). 2010-3: Risk of more bark beetles in a warmer climate; The internet is foremost in the new SLU communication policy; Pernille Karlog: SNS strengthens Nordic cooperation; EFINORD office established; New rector raises student recruitment. 2010-2: Creative desctruction in Finland’s forest sector; Swedish funding requires open access; Ten actions to combat climate change; Shortcuts from Nordic forest research. 2010-1: New SNS project on ash decline; Networking supported by SNS; SNS secretariat moves to Denmark; EFINORD head of office appointed; FIRST strengthens Nordic forest technology research; Outstanding Doctoral Research Award; First genetic mapping of conifer tree starts. 2009-6: Interest in forest education varies among the Nordic countries; Finnish Academy worried about the level of research; Forests and climate change in focus on Forest Day; Nature is important for city-dwelling Finns; Forest unions go Nordic. 2009-5: Nordic forest research will be coordinated from Denmark; Effects of afforestation – the Icewoods project; Forest researchers – check also NKJ; EFORWOOD approaches its final end; What is the ToSIA tool? ; Undisturbed old-growth forests maximizes carbon storage; National key project expands to Norway. 2009-4: Iceland becomes forested again; Successful start for the Nordic CARs; The beauty of nature and social interactions motivate Danish hunters; Strong support for tree breeding. 2009-3: State of the world’s forests; Application for 2010 grants; Still no conventions on sustainable forestry; Shortcuts from Nordic forest research; Maximum growth in Swedish park. 2009-2: NovelTree combines expertise to generate more productive trees; European cooperation in wood-material research funding takes a step forward; Climate change scientists warn: the worst case is the real case; European foresters aware of climate change; Increased biomass production discussed at Nordic seminar; Shortcuts from Nordic forest research. 2009-1: Publication pays off (Norway); SNS board member honorary doctor; Female forest owners need tailored forest services; Project North Hunt; Increased use of wood mitigates climate change. 2008-6: Twelve SNS-financed networks; Three new SNS-projects; Why Nordic cooperation (interview three board members)? 2008-5: Bioenergy havesting in young stands (SNS project); Bioenergy – a hot product from Nordic forests; Bioenergy research around the Nordic countries; Why Nordic cooperation? 2008-4: Resurgence of forestry – campaigns targeted to forest owners; New offices strengthens EFI’s regional presence; EFI – from a local Finnish to a leading international organisation; Nordic cooperation – a necessity; Noltfox – information from 15,000 experiments. 2008-3: Increased runoff, less dead wood and higher carbon sequestration (about shorter rotation times); Metla and SNS move out of Helsinki; Afforestation will change the Nordic landscape; Why Nordic cooperation; Will climate change exacerbate insect damage? ; New network collects information on phenology. 2008-2: Halftime for EFORWOOD – and ToSIA takes shape; Efficient planning with new technologies; New Nordic network activities; Forest management in Europe is sustainable. 2008-1: Traditional forestry and experience economy (seminar report); Metla reorganizes and closes three research units; World’s premier plan to take place in Finland. 2007-6: Children learn from the forest (school projects in Finland, Norway, Sweden, Denmark); New secretary of SNS; GFIS, Sharing forest information globally. 2007-5: Virtual forests help management planning (Heureka, MELA, AVVIRK); GM tree research is needed; Modified wood; Scandinavia under attack – by bark beetles; International conference on seed orchards filled a gap; Ban on pesticides in Swedish forests. 2007-3: New cases of scientific fraud shake Scandinavian research; New Swedish project for better utilization of bioenergy; A forestry voice in Brussels; Shortcuts from Nordic forest research. 2007-2: Focus on environments in two new SNS-granted projects; Larch wood – not the ‘magic solution’ for chemical-free construction timber; Wikis raise delicate quality assurance issues; Finnish research projects are planned on the web; Shortcuts from Nordic forest research. 2007-1: EU Seventh framework programme – €54 billion for research; A joint window on the internet for Nordic-Baltic forest research; Giant reshuffle of Denmark’s academies; PHYSENSE – Physically-based remote sensing of forests. 2006-6: Better wood via breeding – promising Nordic results on inheritance of wood quality traits; Policy-makers and scientists – can they meet? ; The Council of the European Union agrees on Forest Action Plan; Conferences and workshops; Shortcuts. 2006-5: 200 million SEK to tree biotechnology; Jaakko Pöyry has passed away; Swedish silviculture researchers leave academy for industry; Golden branch to tree improver; Norwegian prognostic tools shows that selective cuttings may be profitable; National parks – more visitors with more services. 2006-4: FTP – new Technology Platform to enhance forestry research in the EU; New Norwegian research institute; NordForsk enhances Nordic research cooperation; Prize for innovative timber-sorting system; Shortcuts from Nordic forest research. 2006-3: After the storm: No need to change Swedish forest policy, but there are lessons to learn; The CARs have left the starting grid; Finland versus Sweden; NOLTFOX – the database expands. 2006-2: Most of the Nordic forest is certified; EFORWOOD kicks off; Forest sector does not fully exploit new IT and communication technologies; Nordic forest inventory compiled; Shortcuts. 2006-1: TREESNIPS – Spruce project supported by SNS; Networking – the main focus of SNS cooperation; PATHCAR – a new virtual centre of advanced research; SNS secretariat moves to Finland; New journal takes form – Wood Material Science and Engineering. 2005-6: Family forest owners – key actors in Nordic forestry; All goods have a price; Nordic meeting discussed the value-chains; Swedes find forests important for their well-being; SNS and the journal gain exposure in Australia; Shortcuts. 2005-4: Wood welding – an award-winning discovery; European forest research raises its profile; SNS initiates a new journal for wood scientists; NOVA – a university spanning national boundaries. 2005-3: EFORWOOD; Private Nordic forestry on the web. 2005-2: Editor’s summary; Closer cooperation between Nordic forest research institutes; Forests in southern Sweden struck by ‘storm of the century’; Military radar technology; Shortcuts; Meetings. 2005-1: Editor’s summary; Forest research in the North: Åland; CARs: CARe-For-Us, CAR-ES, GENECAR, OSCAR; Metla House; Topping, an interesting alternative for pre-commercial thinning. 2004-5: Editor’s summary; Forest research in northwestern Russia part II; PROCES – the centre of a network; Shortcuts. 2004-3: Editor’s summary; Forest research in the North: Latvia and Lithuania; Bilateral investment in wood material science. 2004-2: Editor’s summary; NOLTFOX; Carbon storage in forest biomass; Plant protection by beneficial soil organisms; Identification of ectomycorrhizal fungi in Nordic forests; Wood hemicelluloses for surface modification of fibers, paper and boards; Risk management in forestry; Family forestry – future challenges and needs; SilviScan. 2004-1: Editor’s summary; Resistance to root rot determined by the genes; Tools for urban forestry; Selective cuttings from Nordic forestry; Forest research in the North: Estonia. 2003-6: Editor’s summary; Signing off volume 18; Forest research in the North: Danish forest research in brief; New chairman of SNS. 2003-4: Editor’s summary; Forest research in the North: Norway; Final reports from SNS projects; Increased demand for wood in Europe; New Swedish seed orchard program. 2003-2: Forest research in the north: Forests on Iceland; New SNS projects; Forests returning on Iceland; Forest research in Iceland; Forest restoration – a new task for forestry. 2003-1: Editor’s summary; SNS: Networks important for research exchange; 3.5 million Euro for bilateral program on wood materials science; Finished SNS projects; Enhanced Nordic cooperation in higher education; Gender in Nordic-Baltic forestry; No dramatic change in forestry costs & revenue in Sweden 2001; Forest engineering in the Nordic of keen interest for the Baltic forestry; Fireproof wooden houses; Clippings. 2002-6: Editor’s summary; Closing volume 17 – and looking ahead; Thrilling ride on wooden rails; Nitrogen main cause of increased growth in European forests; Nordic success in EU’s research grant race; Protectors of the taiga celebrate 10th anniversary; Clonal forestry – who are you kidding? ; Nordic plant producers seminar – Don’t beat your seedlings. 2002-5: Editor’s summary; 50 million visits to expanding Danish forests; 90 types of protected forest; Tree planting on Faroe Islands; More protected forest needed in Norway; 70 million hectares of certified forests; No more return of the Giant hogweed. 2002-4: From the scientific editor; SNS is an important player in Nordic forest research; Environmental impact of forest nurseries; Composition of ectomycorrhizal fungi changes with carbon dioxide concentration; Seedling responses to temperature and nutrients; Soil scarification has long-term effects; Nordic foresters share common values; The largest undertaking since Systema Naturae; Snippets from Nordic forest research. 2002-3: From the scientific editor; Current SNS activities; New SNS-projects; Scandinavian wolves of eastern origin; Finland, Sweden and Denmark top research list; Shortcuts; Diseases in nurseries. 2002-2: From the scientific editor; Swedish forest policy revised; Conversion of world’s forests; Nordic countries have the cleanest environments; Certification system link up; Nordic and Baltic institutions draw closer; Wood-En-Man; Four years of a service to a changing SNS. 2002-1: From cell to sale (editor’s summary); Northern forests carbon sink; SNS moves to Norway; Wood-preservation with sugar-cane residue; Mycorrhiza inoculated in Icelandic seedlings; Stump treatment against root rot – European survey; Less interest in Svanen eco label; Wood more hygiene than plastic; Forest sinks not included in Swedish CO2-agreement; Forest gene-resources given high priority in Denmark; Excursions. 2001-6: From the scientific editor: A challenging year; Editorial board meeting; NOLTFOX, 12,000 field trials on the Net; Extensive natural resources research program (Finland); 30,000 children met the forest in central Stockholm; Big birds more common in private forests (Denmark). 2001-5: The scientific editor: Advancing the frontiers; Strategy for sustainable development; Obituary (Vilhelm Bruun de Neergaard); Copenhagen declaration on sustainable rural development; Mapping Nordic Wood product research activities; Soil preparation with steam; Motorway-bridge of wood; Sweden – A year of storms and floods; Healthy forests in Denmark; Database on Forest Disturbance; Salt preserves wooden bridges in Bergen; Public access or not? (Denmark). 2001-4: More birch planted in Iceland; Sweden: More protected forests; SNS visit to the Faroe Islands; Editorial board for Scan J For Re; Prescribed burning beneficial for 146 species; Direct seeding of hardwood trees; Forest restoration and landscapes; World’s largest forestry fair. 2001-3: Scientific editor moves on the new challenge; New scientific editor; Water companies and forestry co-operate (Denmark); New slimline organisation (Norway); Detection of root rot in standing trees; New natural repellent may protect tomorrow’s seedlings; Simple language is a necessity (SNS seminar); New thinking in pre-commercial thinning (SNS project); New Danish “Forest-in-School” website.